The stump garden, with newly planted Iris, Violas, chives, and geranium cuttings. The new stump garden, begun in July in the aftermath of losing our oak trees, continues to develop. 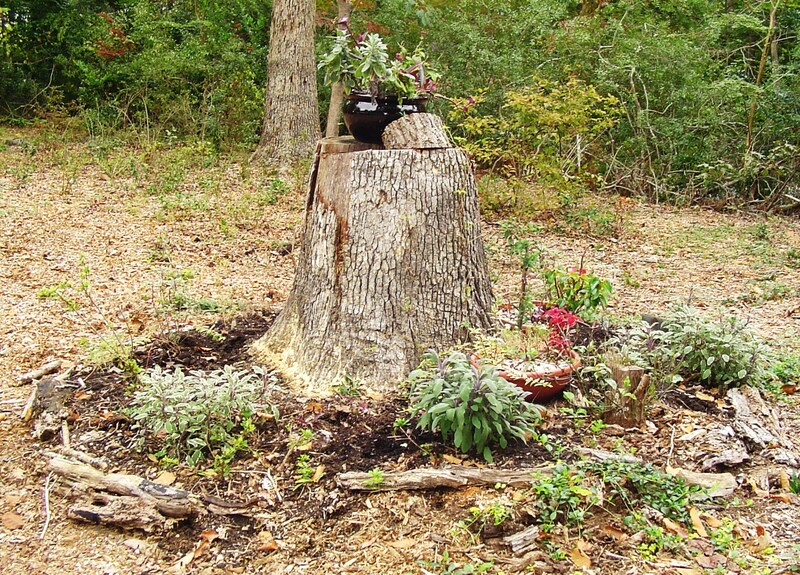 Late July, five weeks after the tree was toppled in a storm, the newly built stump garden begins to settle in. 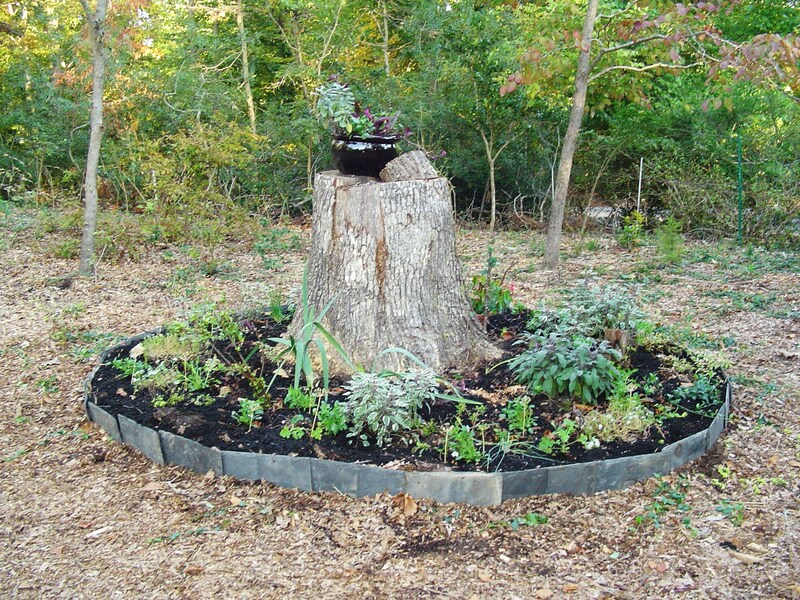 We built it around the stump of one of our lost oaks, on top of its root system, using the Hugelkultur method of building a raised bed on top of scrap wood and leaves. This method, pioneered in Europe, conserves water because the organic matter in the base of the bed absorbs available water when it rains, and then releases it slowly to growing roots as needed. Further, the decomposition of the base material not only produces heat for growing plants, but also slowly releases nutrients to the soil. 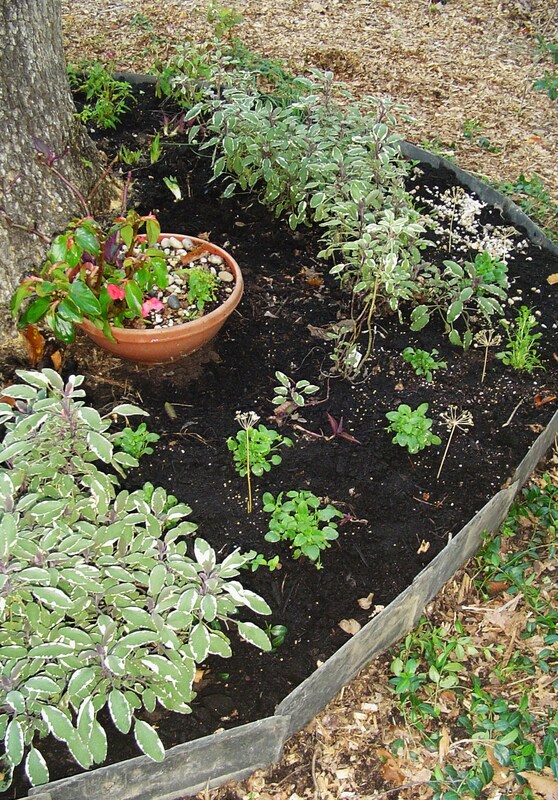 The principles of “sheet composting” are combined here with raised bed gardening practice. Hugelkultur also recycles waste wood and leaves, which was what we needed after the clean up of our downed trees. After building the bed in July, we first added Sage and chives. This is now an area of full sun. Potted plants were moved in from other areas to brighten the newly build bed. Shade loving Hellebores were moved out of the bed to shadier areas. Azaleas, growing around the tree before it fell, were badly broken, as was a Dogwood tree, lost in the storm. 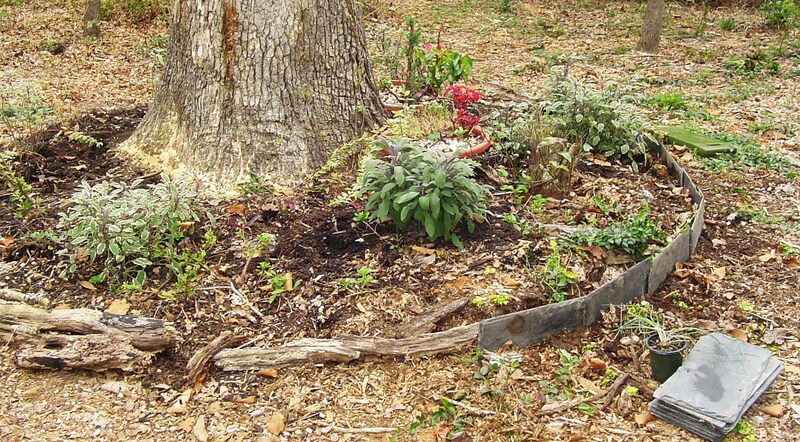 We left them in place, and were careful to not pile compost too high around the remaining stump and branches. The stump garden before this week’s upgrade. In August, we added a few more Sage plants, and some kale. Our problem with deer has been ongoing since they gained access to the garden in June. The deer have made multiple visits to the garden, munching the azaleas, purple heart plant, and finally the kale. The Sage have grown extremely well, most tripling in size. We expect these to take hold and grow here indefinitely. For the time being at least, we are planting more herbs to discourage the hungry deer. Three months after we built it, the bed is ready for more development. Recycled slate roofing tiles make a more attractive border for this bed. First, we added a border of slate tiles found at our local Re-Store, salvaged from someone’s roof. Sunk a few inches into the ground, and reinforced on the backside with scrap wood from the bed, we expect these to make a sturdy and long lasting border. 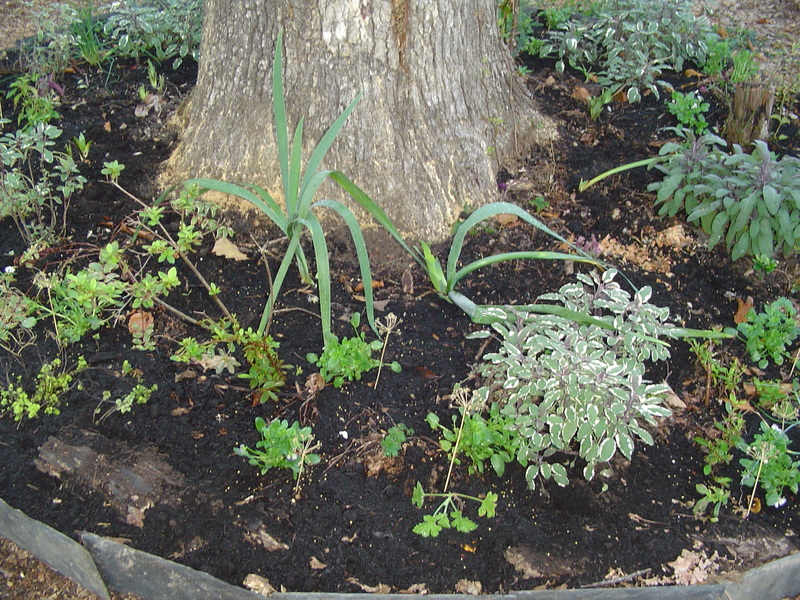 Once the border was in place, we added more compost, and also the contents of all but one of the pots. 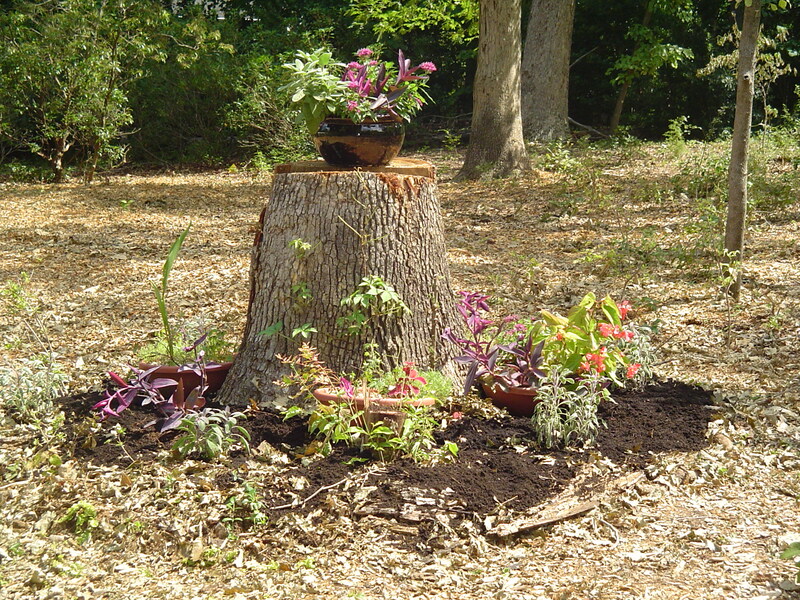 We had hardy geranium and variegated St. John’s Wort growing in the pots, now added to the stump garden. The annual Allysum from the pots will add a little color until a hard freeze. Daffodil bulbs are nestled into the empty spots between the Sage plants. Topped off with fresh compost, and planted with Iris, Violas, and other new plants, this garden will be attractive through the winter and into spring. Finally, I finished this stage of the planting with Iris divisions around the stump, some little Violas, cuttings taken from scented geraniums, more chives, and the dried blossoms of chives. The dried chive blossoms have a strong odor that we hope will deter the deer. The seeds will drop, and eventually grow into additional chive plants. After a good shower of a dilute fish emulsion to water them in, and a good spray of Plant Skydd to discourage the Bambis, we expect this little garden to take off and look full and beautiful throughout the winter months. That’s a very nice mini garden.